Canadian journalist, author and former television broadcaster Alan Hustak has written for every major newspaper in the country. 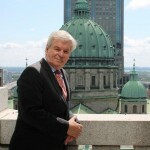 Honoured with the Queen’s Diamond Jubilee medal for “chronicling the lives of deserving Canadians and their institutions,” he is the author of more than a dozen books including biographies and histories of several corporate institutions including St. Mary’s Hospital, the Old Brewery Mission and St. Patrick’s Basilica. He is also the author of Titanic, The Canadian Story.Born in Saskatchewan, educated by Jesuits in Regina and in Washington D.C.
Hustak arrived in Montreal for a weekend in 1967 to attend the opening of the World’s Fair He has called it home ever since. “It is the longest weekend I have ever spent anywhere,” he says. Although retired from the Gazette, where he worked for almost 25 years, he continues to freelance for The Globe and Mail as well as several on-line sites, including Ville Marie on Line and The Metropolitain.